Each Monday, I post a tip that I find useful in the bungalow kitchen. Last week I shared my deep love of Mason jars; not only are they useful they are in keeping my kitchen organized but they look pretty while doing so. Today I’d like to share another use for these practical, pretty containers: reusable to-go cup. When I go to the farmers market on Wednesdays, I leave the bungalow very early because being one of the first to arrive at the farmers market has many benefits: less traffic, more parking spots, smaller crowds, and not surprisingly, a larger selection of produce to choose from. I confess, though, that the morning is not my best or most productive time of the day. Getting out the door always has been a challenge for me, and I need all the help I can get! 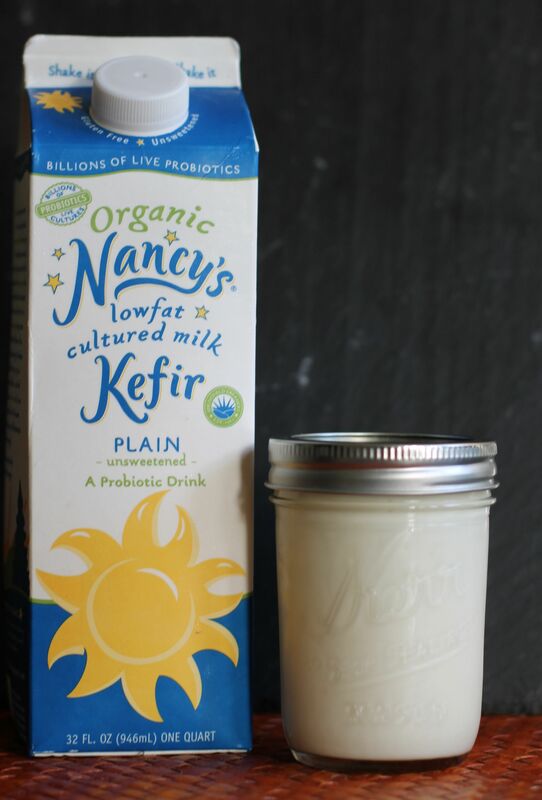 One morning, I was searching for a grab-and-go breakfast and the kefir jug caught my eye. I considered drinking straight from the carton, although decided against it not only because it as poor manners but also because the carton was half full and I didn’t want to waste the portion I couldn’t finish. In a pinch, I filled up a small Mason jar, screwed on the lid, and threw it into my bag before running out the door. It was a perfect solution, as I sipped a healthy breakfast on the way over to the farmers market. When I was finished, I simply put the lid back on, keeping any remaining liquid from spilling in my car. Clever! If you’re a smoothie lover, you might also like to try this tip because it allows you how to take your creation on the go: pour your smoothie mix into a Mason jar, top with the lid, and take it with you! When you’re finished enjoying your smoothie, replace the lid, throw the jar back into your bag, and feel confident that it won’t leak or create a mess. If you come up with any clever ideas to add to this discussion, please feel free to share them!